M.E.C.’s High Power 80-H Series and Extra-High Power 80-E Series terminations are constructed out of finned aluminum waveguide, which contain high temperature absorbing material intimately connected to the waveguide walls for efficient heat transfer. 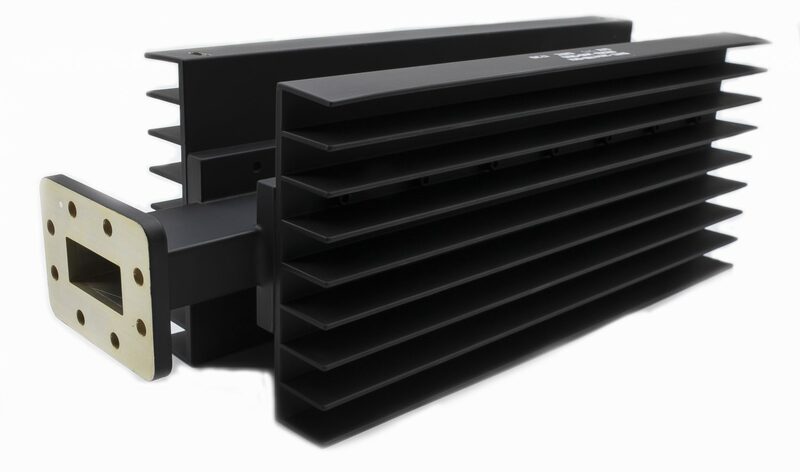 Standard units of 1,000 W or less are cooled by free air convection while units of more than 1,000 W utilize forced air cooling. 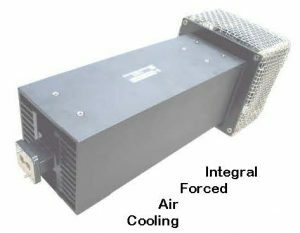 For higher powers, shorter lengths, or lower temperature rises, an integrally mounted fan and ducted housing may be supplied to provide forced air cooling. The full waveguide frequency band VSWR is 1.05:1 max. for the 80-H series and 1.06:1 max. for the 80-E series. Designed to withstand conditions of extreme temperature and thermal shock, these terminations are ideal for use in high power systems as dummy antennas to permit testing, tuning, and maintenance without radiating RF power. Optional sampling probes from 30 to 50 dB, with typical sampling flatness of ± 0.5 dB across the entire band, may be supplied as separate units to monitor power and are available for both 80-H and 80-E Series units. Finish is chemical film per MIL-C-5541, Class 3, followed by high temperature black epoxy enamel. (1) Order by model number and specify actual frequency range, VSWR, and pressurization required. (2) For power sampling, add suffix “PS” to the model number and specify desired level (30 to 50 dB). (3) For integral, forced air cooling, contact M.E.C. (4) Customized mounting, half-height models, other flanges, and frequencies are available upon request. All customer designs are welcome.